A push mower can be just what you need to get through the tough grass in your yard when you’re not looking to spend the big bucks on a riding mower. There are lots of options to choose from, so we’re going to break them down and give you our top picks. We’ll look at things like cut diameter, power source, and the all-important features to make sure that you can walk away with the best push lawn mower for your overall needs. We’ve outlined the best push mowers for several different categories below. Let’s get started! Remington’s mower is one that can check a whole lot of boxes you may have. The cut diameter on this one is 21 inches, which is about as big as cut diameters can get on mowers. It may not be a make or break feature, but bigger cut diameters mean that you won’t have to take as many passes through your yard to get it all cut. This mower comes with the option to side-discharge, mulch, or bag your grass after you cut it. No worries if you don’t know what that means, we break it down for you in the Frequently Asked Questions section (so you might want to read on). This mower comes with 6 different height adjustments ranging from 1-1/4″ to 3-3/4″ so there are plenty of options to customize how you want your yard to look. This mower is gas-powered. That’s neither a pro nor a con but is something to be aware of. The initial upfront cost will be less, but the mower will cost you more over time than an electric mower would. Gas-powered mowers are most often a bit stronger than their electric cousins, so you can be sure that this mower will annihilate some thick and tall grass. Remington’s mower comes with a 2-year warranty. This is the best push lawn mower for anyone who wants a gas mower with lots of customization options or those who have yards with grass that’s too thick for electric mowers. Snapper’s 19-inch cordless electric lawnmower presents us with an option that is all that the industry should be. This is a great mower for a wide range of yards from very small to very large. This mower comes with two batteries that should last you about 45 minutes each. A fast charger is included and can charge a battery in about 30 minutes, so you can mow by swapping one battery for the other and putting the spent battery on the charger. By the time you use up one battery, the other should be charged. The Snapper 19-inch comes with load-sensing technology, detecting how much power it needs to mow your grass and adjust its output. This helps save your battery, but the 45-minute battery life will be drained faster on taller or thicker lawns. Snapper’s mower comes with options to bag, side-discharge, or mulch your grass. One possible downside here is that the bag isn’t very big, so you may need to empty it quite often if you decide to bag your grass. This mower comes with 7 levels of height adjustment ranging from 1-3/8″ to 3-3/4″. Height can be adjusted using a lever, but some buyers said that the lever was a little hard to use. This mower weighs 59.5 pounds and the handles can fold, so storage shouldn’t be difficult. 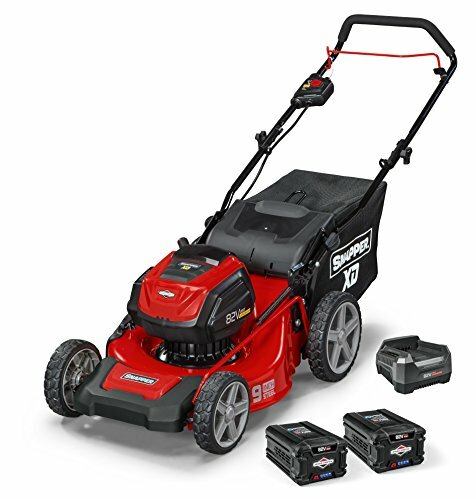 There is a 5-year warranty on the mower itself and a 2-year warranty for the batteries and charger. When all is said and done, this is a powerful mower that has enough customization options where you can get your yard to look just how you want it. If you’re looking for the powerhouse of cordless electric lawnmowers, the Greenworks Pro 21-Inch might be a good fit for you. At 21 inches, the Greenworks Pro has a wide cut diameter, meaning that you won’t have to make as many passes around your yard to cut all the grass. 2 batteries and a rapid charger are included. The specs for the batteries and charger are about the same as the Snappers reviewed above: each battery should last you the better part of 45 minutes and the charger can charge the batteries in about 30 minutes. Another feature of the Greenworks Pro is the load-sensing technology. Your mower will be able to detect when it needs to amp the power-up or scale the mowing down, making sure that you aren’t using too much battery for what you need. Another point for this mower is the fact that it, too, can side-discharge, mulch, or bag your grass for you. It has 7 levels of height options ranging from 1-3/8″ to 3-3/4″, so this mower allows you to customize how you want your yard to look. 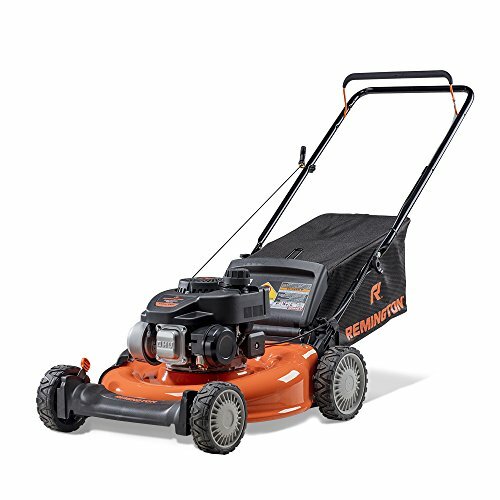 This mower packs a punch and it has a larger cut diameter than many other electrical options. But that power comes at a price: this thing is heavy when compared to other electric mowers. The Greenworks Pro is still a lot lighter than almost any gas-powered mower you’ll find on the market, but it clocks in at 79.5 pounds. If you are looking for the easiest-to-handle mower on the market, this one may not be for you. It’s a good pick for someone looking to get rid of tall, thick grass or someone who wants a wide cut diameter for their electric mower. This mower comes with a 4-year warranty on the mower itself and a 2-year warranty on the batteries and charger. This mower is a great pick for those who want a wider cut diameter to reach all corners of the yard. This mower has the power to cut through thick grass but isn’t an ideal option for those who want a very light mower (for that, read on). If you were on a grass-covered, deserted island and could only pick one corded electric lawnmower, we’d recommend this one be at the top of your list. This Greenworks mower has a 20-inch diameter and at 12 amps, will cut through grass that you’ve let grow for a bit. This mower also comes with the attachments to cut, collect, and mulch your grass. We discuss the differences between these three options later on, but for now, just know that this mower can be used for a variety of yards with a variety of desired looks. The mower comes with 7 height adjustments ranging from 1-1/2″ to 3-3/4″, so you have lots of options on how tall you want your grass to be. These height options are also helpful if your grass is already wildly tall and will need to be cut in stages. You can start this mower with the push of a button, so no worries about having to pull the mower chord until you throw out your back. The handles fold up for easy storage and the mower weighs about 56 pounds, so it’s much easier to maneuver around than a gas mower or even a battery-powered one. This mower comes with a 4-year warranty. If you’re looking for a powerful corded electric mower that can handle your yard in all seasons and one that isn’t too tough to store, then this may be a good pick for you. 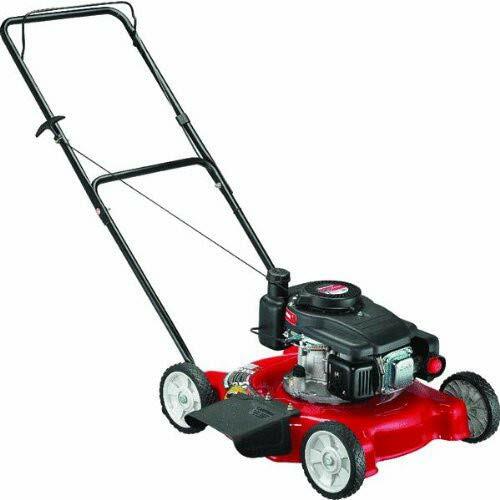 132CC GAS ENGINE: Reliable gas engine perfect for mowing small-medium sized yards. 3 CUTTING HEIGHT POSITIONS: Cut the grass down to your ideal size! 20-INCH CUTTING DECK: Side discharge deck with 20" cutting width. 7 X 7 INCH WHEELS: Lightweight design with 7-inch rear and front wheels for easy maneuverability. The Yard Machines mower makes for the best budget push mower buy since it’s powerful enough to cut through the toughest of grass but lacks a lot of the bells and whistles that you may not think are necessary. This is a gas mower, so you can be sure that it’ll get the job done. It’s cut diameter comes in at 20 inches. This mower doesn’t include bagging or mulching options. If this is the one for you, be aware that you’ll only get the ability to side-discharge your grass. This mower does have 3 height options ranging from 1-1/4″ to 3-3/4″, so you will be able to get the height you desire on your grass. This mower comes with a 1-year warranty, which isn’t very long for a gas mower. All in all, this is the mower we recommend if you have thick or tall grass, don’t mind a gas mower, but are looking for a budget purchase that can get the job done. On this list, we took a look at both gas powered and electric mowers. Each kind has its own benefits and challenges, so we’re going to break those down for you. In general, gas mowers are stronger than electric mowers. Gasoline provides the extra oomph that electric mowers just haven’t caught up to yet, so gas is a good option if you have very thick grass or have a bad habit of letting your grass grow too tall. Gas mowers will tend to be a lot nicer to your wallet on day one, but it doesn’t take too long for the honeymoon phase to give up the ghost. Gas mowers require a myriad of maintenance: they’ll always need more gas (mowers have to eat too), you’ll need to change the oil, spark plugs, keep an eye on the air filter, and you’ll always start the mower by pulling on the dreaded rope. Angie’s List has a list of things you’ll need to keep an eye on. A gas mower won’t cost you an extra hundred bucks in the first week or even in the first several months, but those small costs do add up over the years. Maintenance takes more effort on gas than on electric mowers, plus there are always more parts that can go wrong. If you’ll notice, all of our electric mowers on this list have longer warranties than the gas mowers. There’s a reason for that: electric mowers last longer. Electric lawn mowers tend to run your bill up on the initial buy, but don’t require as much work over time and are less subject to wear and tear. Keep in mind that it may take years to recoup your costs though. Electric mowers tend to be a lot quieter than gas mowers, having a volume level of somewhere near your average vacuum cleaner. These mowers can be a tad weaker than gas mowers, but this shouldn’t be a problem if you keep your yard well-maintained or don’t have very thick grass. In the two electric mowers we looked at today that uses batteries, the battery is the biggest distinguishing factor between mowers, so it’s important to choose the option that’s right for you. It’s helpful to remember that one of the biggest expenses of maintenance for your battery-powered or cordless electric mower will be your battery. You’ll never have to change the oil, spark plugs, or refill on gas, but one day your battery will give out on you. For that reason, we at OwnTheYard recommend mowers that come with 2 batteries. Having a mower with more than a single battery will be helpful when one battery gives out on you after the warranty, and will also help ensure that you get a longer mowing time. Perhaps your grass is extra thick one week or you forgot to recharge your battery after your last cut – you can pop that extra battery in and get right back to work. Do I need the mulching, side-discharge, or bagging options? Before we answer this, let’s take a look at each of these features. Mulching cuts each blade of grass twice: once from the ground, the second time from inside the mower to grind up the grass. The grass is then deposited beneath the mower. Mulching may require you to walk a bit slower as it is a more time-consuming process, but the grass clippings will be able to biodegrade into the ground and aid future growth. Bagging causes all the cut grass to be collected in a bag so that it can be deposited elsewhere. This process is also a bit time consuming, as you will need to empty the bag when it’s full. Side discharging the grass is just what it sounds like: when the grass is cut, the mower shoots it out to one side. This can be the fastest way to cut the grass, but you will need to watch out to make sure your grass isn’t thrown into your natural areas or gardens. If you’re looking to cut your grass as fast as possible, we recommend going with the side discharge option. You may end up leaving some grass clippings in your yard, but you can either cut over those clippings again or allow them to degrade au naturale. If you have a specific spot you want to put your cut grass to allow it to biodegrade and nourish the ground in a certain area, we recommend going with bagging. If you want your cut grass to go back into the yard to nourish it, we recommend mulching. What options you need will depend on what your preferences are for how your yard looks and what you want to do with it. Remington was founded in 1921 by a man named Arthur Mall in Milwaukee, Wisconsin. Remington soon grew famous and spread wide due to the quality and dependability of their work. They are committed to keeping the quality of their work high today. Snapper was founded in 1951 when they made the first self-propelled rotary lawnmower. Since then, they have become obsessed with making your yard look how you want it. They have a wide range of yard tools, mowers, and tractors to help you achieve your goals to own your yard. Greenworks was founded in 2007 to begin solving a large and growing need: they wanted to make battery-powered equipment strong enough that it could compete with the gas-guzzling kings of lawn care. Greenworks hopes to help the environment by providing battery-operated lawncare equipment tough enough to solve all your yard needs. Yard Machines is a part of MTD Products. Founded in 1932, Yard Machines remains committed to the core values of their founders: Stewardship, Passion, Respect, and Integrity. These values have been integral in their success today. Thanks for reading our guide on the best push lawn mower! When it comes down to it, the best option for you is going to be the one that suits your unique needs best. 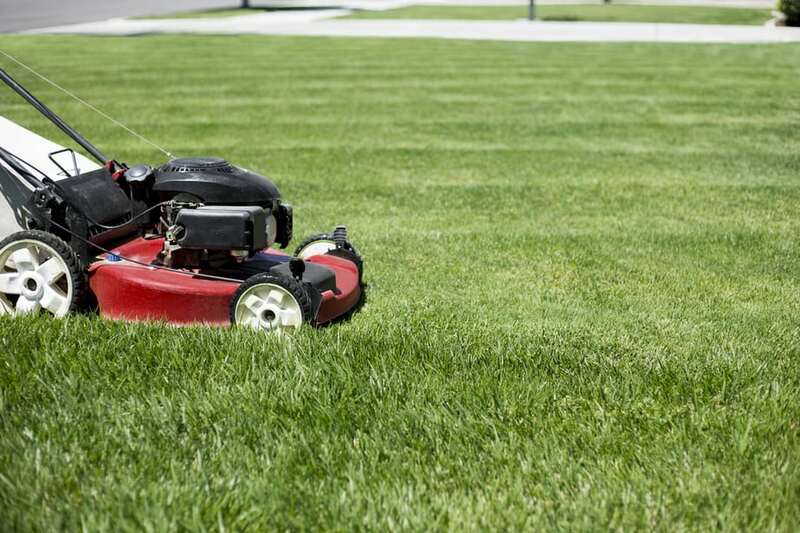 Take note of the size of your lawn and the thickness of your grass to determine whether you’ll want a gas, battery-powered, or corded lawn mower. Ask yourself what you want your yard to look like and how you want it cut – are options like side-discharge, mulching, and bagging important? Lastly, take a look at your budget. We’ve reviewed lawnmowers from the high end picks to the most budget-friendly options, so there is surely something for everyone. Our top gas lawn mower pick is the Remington Trailblazer 21-Inch. If you’re looking for the best battery-powered or cordless electric lawnmower, we recommend the Greenworks 21-Inch or the Snapper 19-Inch. 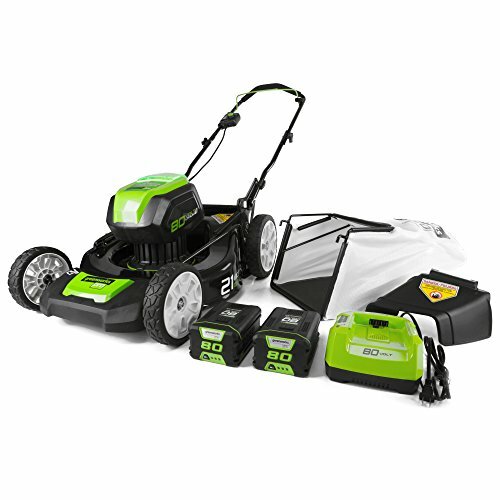 For corded mower, we suggest the Greenworks 20-Inch. The Greenworks 20-Inch is also a great budget buy, but our top budget mower is the Yard Machines 20-Inch. The best push lawn mower for your needs will be the one that can get your yard just how you like it, so don’t be afraid to take a little time looking around and being picky. There’s something for everyone here.